Is it a supernatural powers of Russian women? Or maybe it’s just a photoshoped image? No! This boulder is from pumice-stone, the lightweight mineral which is formed from volcano lava. 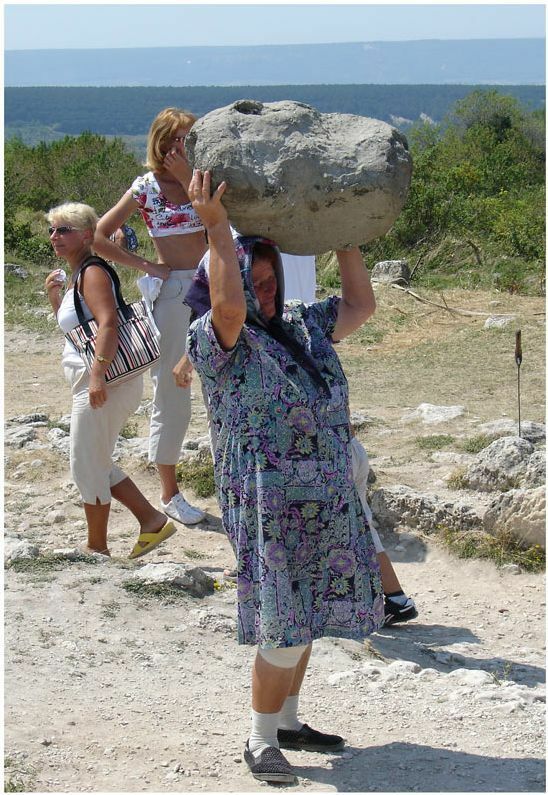 So even the boulder of such size can be lifted easily. And not only by Russian women. This is pumice! A volcanic rock that has so many pores that a boulder that big could weight no more than 5-7 kilos. I just wonder where did she find volcanic rocks in Russia? maybe it is not in Russia? If the stone is not heavy, then why is she wearing a bandage over her knee? I concur with illlich! >if the stone is not heavy, then why is she wearing a bandage >over her knee? I think the bandage was earlier over her head to protect head from heavy stones, but … it did hatten. You think she was pushing so hard, the bandage slipped to the knee? Could be, could be — the stone is very heavy then! It looks like that thing Joe Dirt found.